Dislikes: Loud noises get me every time though! I have to realize there’s nothing there, then I’m fine. Cooper is a very sweet dog that has really progressed since arriving from the puppymill. 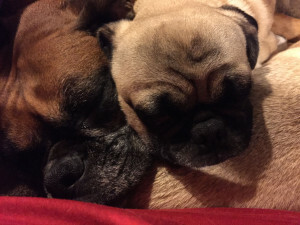 He has grown very attached to our resident pug and for that reason will need to be adopted into a home with a resident dog that doesn’t mind another dog in its personal space. Cooper does well with doing his business outside, but still wears a belly band for occasional marking although it has become much less frequent. Cooper does really well sleeping through the night in his kennel overnight and during the day while we are at work. Due to dry eyes, he requires medication in his eyes at least twice a day, and tolerates this very well. He loves to cuddle with resident dogs, receive pets and attention from people, and exploring outside. He is still a bit leery of car rides but Cooper is a very easy-going dog and will be a great addition to any family. Interested in adopting Cooper? 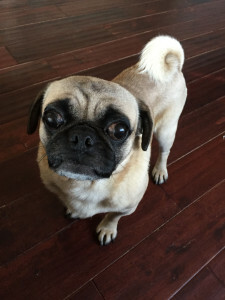 Please see our website and fill out an application at: www.pugpartners.com/adoption-application Cooper’s minimum adoption donation is $350. 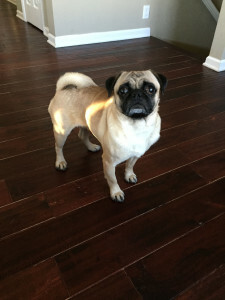 Cooper – Available for Adoption!